My son told me he wanted to learn Japanese. I told him to check out our portfolio company Duolingo‘s awesome language learning product of the same name. He told me that he has used Duolingo and likes it, particularly the ability to generate streaks. He told me that once you have a streak going, you really want to keep it going and that keeps you at the language learning exercises that are the heart of Duolingo. Yesterday, I kicked off my weekly game of Swarm (from our portfolio company Foursquare) with some big point generating check-ins. My daughter, who I play the game each week with (among others) also had a quick start. 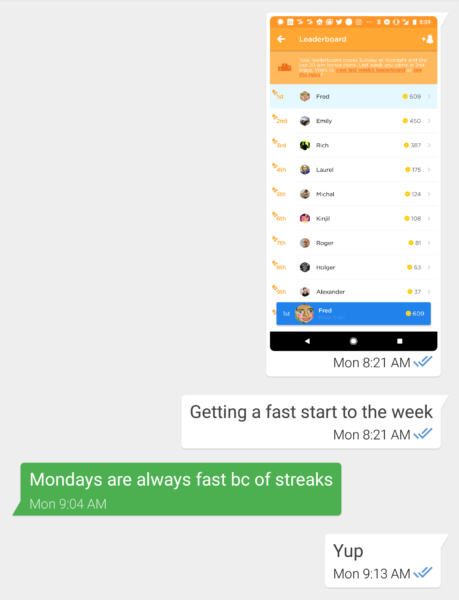 Streaks are a terrific game mechanic and can be used to motivate user behavior. But streaks are also powerful in real life. This blog is a good example. When you have posted every day for fifteen years (that anniversary is coming up this fall), you have quite an incentive to keep it going. And the same is true in the VC business. When you have had a big win every year for the last eight years, you want to keep that going. When you have had four highly successful VC funds, you want to make the fifth work. Keeping something going is a powerful motivator. So when you have that day or week you really don’t want to get up for, think about your streak, get up for it, and do it.